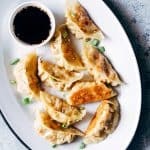 These vegetarian gyoza potstickers are stuffed with a delicious mixture of carrots, shiitake mushrooms and paneer and are insanely ease to make! Don’t be intimidated because I have step by step instructions for you to make them at home. Guys today is monumental because learning how to make and wrap potstickers has been on my bucket list forever! But when you have friends who’ll patiently sit and teach you how to make them, everything becomes easy. Here’s what happened. Maggie, a food blogger at omnivores cookbook have been friends for a few years now. We’ve chatted on facebook but never in our wildest dreams thought we could actually meet in real life. 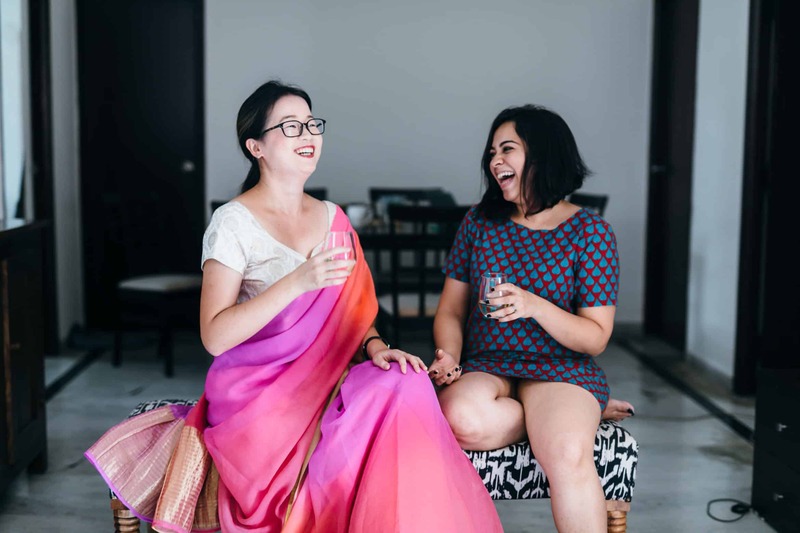 So when she messaged me to tell me she’ll be travelling to India, I was majorly excited and invited her to stay with us for a few days in Bangalore. Honestly, I was also a little nervous about how it’d be to meet an online friend in person. But we had soooooo much fun that it was like we’d always known each other. We planned and planned everything that we were going to do, and I think we managed to do about 50% of all the things on our list. Only 50% because we were so busy talking most of the time. I’m talking late nights and early mornings and everywhere in between. BTW we got her a beautiful saree to take back to the US, and you can see how happy she is wearing it. One thing that was definitely on our list was to cook together. We started with a loooong list of things to make, and finally narrowed it down to two Indian dishes and two Chinese dishes. We were super excited to teach each other about what our side of the world eats. I’m just going to let you feast your eyes on the spread we made. Trust me, when two food bloggers meet, there is no place a for a third person. 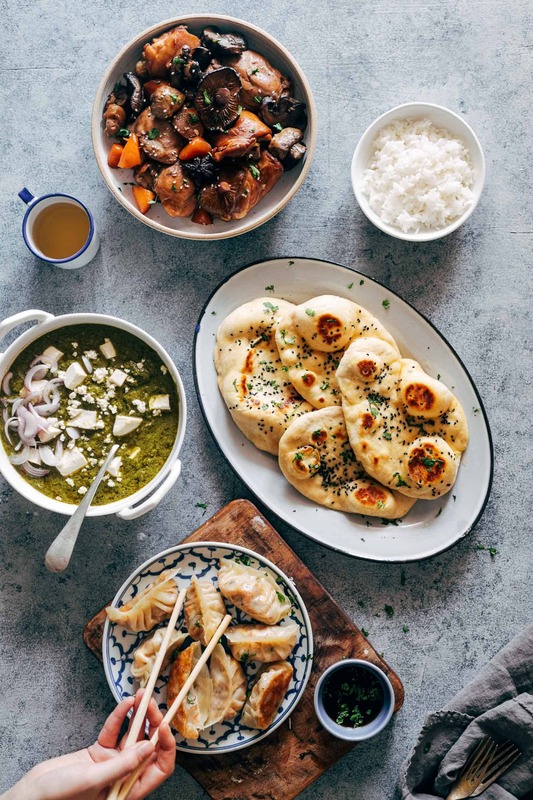 We spent the entire day cooking palak paneer, my super fluffy instant naan, delicious braised chicken and mushrooms and yessss – vegetarian gyoza potstickers stuffed with carrots, shiitake mushrooms and paneer. Maggie’s blog is a treasure trove of chinese recipes and I’ve been referring to them for some time now and I can tell you – every recipe is a five star! She makes authentic chinese cooking feel so easy and effortless that you’d never go back to ordering takeout. The idea was to actually photograph everything and show you guys the pictures but disaster happened – I lost my SD Card (weep weep) and had to reshoot all the vegetarian gyoza potsticker pictures again. But this also helped me make them again for you guys and this time include step by step instructions. I can imagine how intimidating wrapping your own potstickers can be. But just give it a go. Because if I can do it, you, my talented foodie friends can definitely do it! 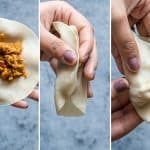 Because these were sooo new to me, I must’ve asked Maggie at least 256 questions about them and I have to share a few of them with you because we need to become vegetarian gyoza potsticker ninjas! Chinese potstickers are basically dumplings (also known as momos in India) that are stuffed and pan fried. Their name comes from the Chinese name 鍋貼 guotie which literally means ‘pan stick’. While cooking potstickers, they literally stick to the pan hence the name. Dumplings which are boiled or steamed are called 水餃 shuijiao and 蒸餃 zhengjiao respectively. I have step by step instructions to cook these vegetarian gyoza potstickers for you below, but to summarise, once they are wrapped, they are added to a pan with some oil. Once the bottom gets nicely toasted and golden brown, a little water is added to the pan to steam them. The entire water evaporates and you are left with potstickers that sort of stick to the pan and have a crispy bottom. Can I steam these dumplings? Absolutely, if you are not a fan of pan frying dumplings, you can always place these in a steamer and steam them for 8-10 minutes. What’s the difference between gyoza and potstickers? 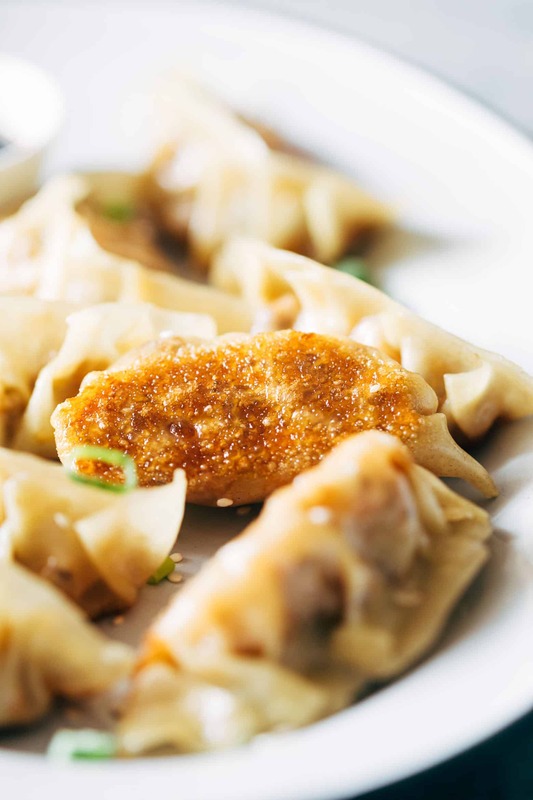 So gyoza and potstickers come from two different regions – Japan and China respectively. Gyozas are very similar to potstickers in the sense that they are pan fried as well, but are smaller, more delicate and made with pre-fabricated sheets (which is what I used to make these vegetarian gyoza potstickers). Potstickers are made with homemade wrappers and have a slightly thicker wrapping. Since I’m going to need Maggie to come down again to teach me how to make the homemade wrappers, I decided to call this recipe vegetarian gyoza potstickers. What goes into the dipping sauce for potstickers? 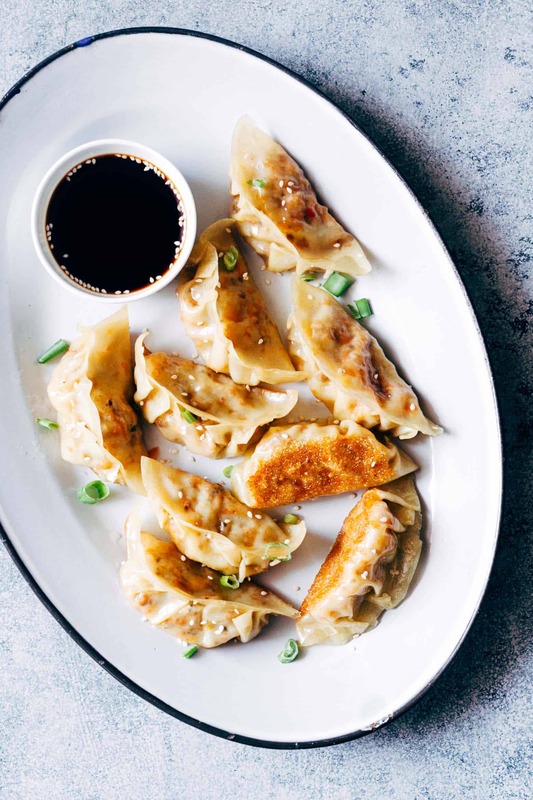 According to Maggie, the dipping sauce for these vegetarian gyoza potstickers is made by whisking together soy sauce, rice wine vinegar, sesame oil, brown sugar and crushed red pepper flakes (optional). I also added some sesame seeds for flavour and crunch. And let me tell you, that potsticker dipping sauce is crazy good! Are you convinced yet? 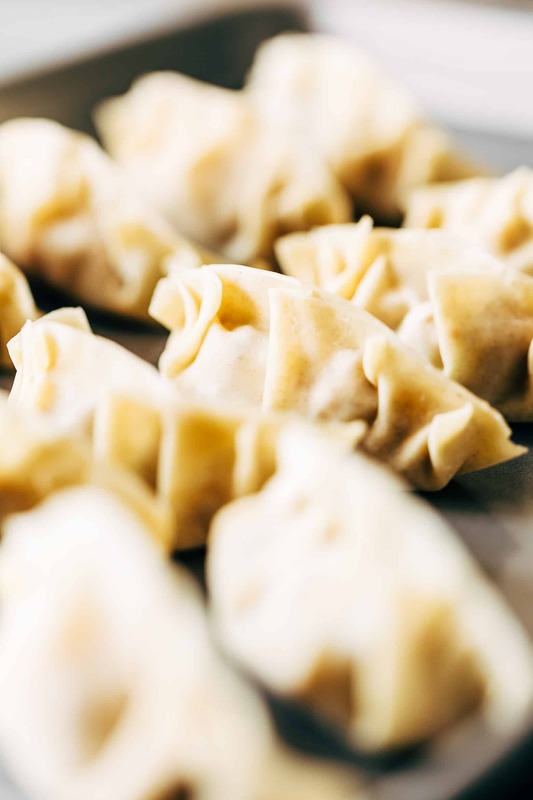 If you are giving these vegetarian gyoza potstickers a try, I also want to share with you this amazing video that Maggie made which will make making potstickers a cinch. The video already has over 900,000 views on YouTube and she goes into details of how to make your own homemade wrappers if you want to give that a go too! 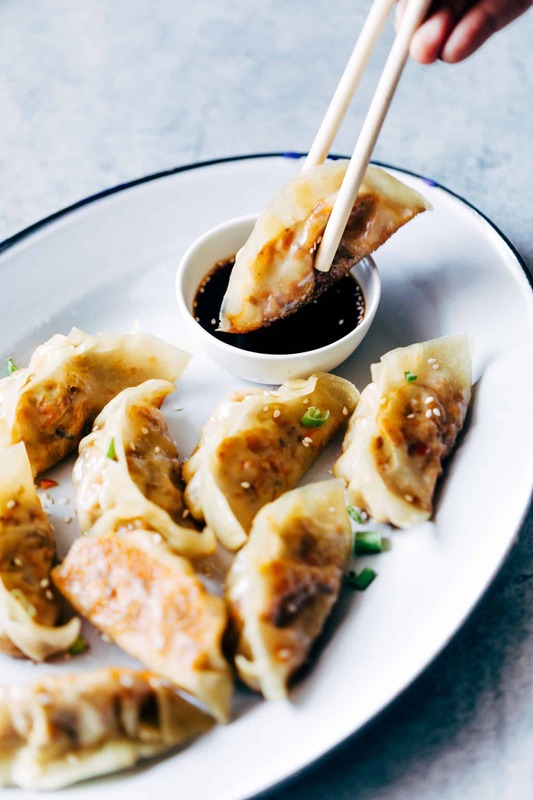 These vegetarian gyoza potstickers are stuffed with a delicious mixture of carrot, shiitake mushrooms and paneer and are insanely ease to make! Don’t be intimidated because I have step by step instructions for you to make them at home. Drain the shiitake mushrooms, and add them to a food processor with the diced carrots. Pulse until everything is minced but not mushy. Alternatively, you can also grate the carrots, and chop the mushrooms finely with a knife. To make the filling, heat sesame oil in a pan and add ginger and garlic to it. Saute for a few minutes till fragrant and add the carrot and shiitake mushrooms mixture. Cook the mixture for 4-5 minutes till the carrot is cooked through and add paneer, soy sauce, salt and pepper to the pan. Cook for another minute or so and set aside to cool. To start wrapping the dumplings, prepare a large tray to keep the dumplings by spraying it with oil. Also keep a small bowl filled with water, the gyoza wrappers, the filling and a wet towel ready. Place them one by one on the greased tray, making sure they are not touching each other. Cover them with a wet towel to prevent them from drying out. To cook the dumplings, heat a tablespoon of oil in a large skillet and place a few dumplings in the pan, making sure they don’t overlap. When the dumplings start to sizzle, add 1/4 cup water to the pan and cover. Cook until all the water evaporates and the dumplings start to sizzle again (about 4-5 minutes). Remove them and repeat for the remaining dumplings. Serve immediately with a dipping sauce. Wow, loved everything about this post, recipe, story, cooking with fellow blogger, and all the tidbits that you have shared. Also loved the idea of saree gift and the picture of Maggie wearing it. The pot stickers look delectable. Thank you, it was super fun! Thanks Richa – I pinned the post and plan to make some soon. I’ll let you know how it goes.. So much in love with this Post Richa. Must have been super duper fun cooking and shooting together..
That Saree pic is a killer!! Kudos to the photographer..
Hi Richa! Discovered your blog through Maggie’s Omnivore’s cookbook. Love your story of cooking together. What a wonderful exchange of recipes, passion and laughter. I’ve always been wanting to learn some authentic Indian dishes. Your blog seems to be a good resource. Love your photographs too! Anyway have a great day! Thanks Wei! So glad you stumbled upon the blog. You totally nailed the potstickers girl! I really love these close-up pictures that show off the crispy texture 🙂 Hope you have a great weekend and can’t wait to cooking with you again! Thanks much! I hope I got all the chinese terms right 🙂 Can’t wait to see you again!